I rarely come across products I downright dislike. I think it is mostly because I do so much research on the product before I buy it, particularly if it is a product that is meant to “battle” a particular concern. Don’t get me wrong, I do plenty of impulse purchases but they are usually limited to makeup, rarely skincare. Because of this “Why not to buy” skincare posts may be few on the blog, but I do have one disappointing product I wanted to share. The moment I started applying something over it, it started to peel. I was very sad that that the Origins GinZing eye cream did not work for me. I had such high hopes for it. 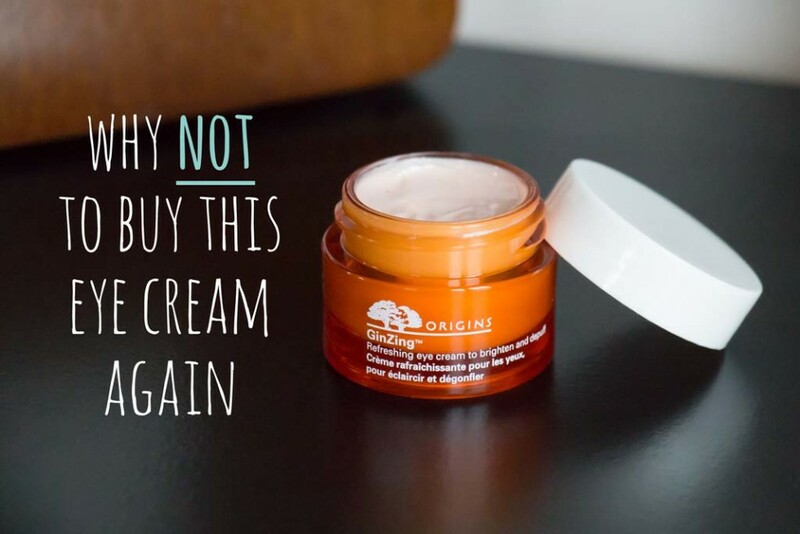 First of all I love Origins products in general, the cream had fab reviews from people I trust, when I looked the description of the product it sounded it would do what it was supposed to do. Well, it doesn’t, and for me, it creates more problems than it solves. It is not so much that I have an issue with the active ingredients. It’s packed with goodies like Ginseng, Magnolia and Caffeine, all good for brightening the under eye area apparently. The problem is that in addition to these natural ingredients there are shimmery cosmetic brighteners in there that act as light reflectors meaning to visually brighten your whole under eye area. And in these lies the problem for me. The Titanium dioxide, mica and iron oxides, which give the cream its optical brightening effect, sit on top of your skin and create problems for me. Two things happen when I apply. Once I am finished with patting in the cream and then try to apply concealer over it two mix and start to peel and crumble. I have tried with tiny quantities, I tried letting it sit for a while, I tried to buff it with a brush, but nothing worked. The moment I started applying something over it it started to peel. Once you get it to be as smooth as it is ever going to be it promptly starts to fall apart and you can see grainy bits of cream particles mixed with the concealer. I am not sure how to explain it well, but it is almost as if the concealer particles bind with the cosmetic brighteners and create bigger particles, so you can really see both products sitting on top of you skin. Not a cool look, trust me! Trying to blend out is impossible because it just makes the peeling worse. Finally you give up and then it rewards you with settling in your fine lines within 10 minutes. For whom it might work? It may be good if you have no fine lines and only have a little bit of darkness that you need to lighten. For very dark circles, particularly if you are like me and need to apply a more high coverage concealer, I would stay away. IF you have lines, then this is big no. I now use it only on no make up days. I wasn’t a huge fan of it either: on me it didn’t start peeling, but it also wasn’t very moisturising, it didn’t combat dark circles or anything, and I think you can get better ones that are the same price or less. Thanks for the recommendation, I will check it out!